The actor Nakamura Kiyosaburô I held this name from the 1720s to the 6th lunar month of 1777. Dates of birth and death unknown. Son (or adopted son?) of Nakamura Kiyosaburô I. His first stage name was Nakamura Matsubê III and he became a wakaonnagata in Kyôto in the 11th lunar month of 1776. 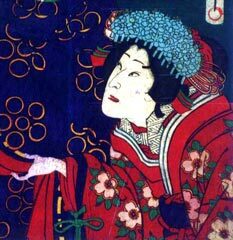 He took the name of Nakamura Kiyosaburô II in the 11th lunar month of 1778 at the Naka no Shibai, playing the role of Orikoto in the kaomise drama "Toki-ni Tôdai Sennin Kagami". He went to Edo with Arashi Hinasuke I in Fall 1780 and played at the Moritaza in the 11th lunar month of 1780 the role of the keisei Ôyodo in the kaomise drama "Tokimekiya Oedo no Hatsuyuki". He went back to Ôsaka in 1781, where he ended his career in koshibai venues or tabi shibai. His last-recorded performance was in Ise at the Furuichi no Shibai in 1786. He was excellent in yatsushigoto and was most likely the adoptive father of Nakamura Kiyosaburô III. Dates of birth and death unknown. He was born in Kamigata and was most likely the adopted son of Nakamura Kiyosaburô II. His first stage name was Nakamura Kiyozô and he took the name of Nakamura Kiyosaburô III in 1799. He did not perform in ôshibai, only in miyaji shibai or tabi shibai in Kamigata. He took the name of Takeda Kiyozô around 1808, when he performed in Ôsaka at the Goryô no Shibai (miyaji shibai). We don't know what happens to him afterwards for he disappeared from the records. He was a wakaonnagata actor. Was he the master of Nakamura Kagyô (the question is open)? Date of birth unknown. Disciple of Nakamura Kanzaburô XIII, his first stage name was Nakamura Ichô I. He took the name of Nakamura Kiyosaburô IV in January 1875 at the Shintomiza. This onnagata actor unfortunately died in his prime, the 19th of October 1877. Dates of birth and death unknown. He started his career as a disciple of Kataoka Ichizô I. He held during his training years the names of Kataoka Ichô, Kataoka Rojaku and Kataoka Ichômaru. He became a disciple of the Kamigata star Nakamura Sôjûrô and took the name of Nakamura Kiyosaburô V in March 1875 in Ôsaka at the Naka no Shibai. This onnagata actor was active in Kamigata up to Fall 1883. We don't know what happens to him afterwards for he disappeared from the records.